(WARNING – iPhone X and Star Wars Spoilers ahead!) 2017 goes down in my personal history as a year in which I was eagerly anticipating 2 major events in December; the arrival of the 9th generation Apple iPhone product (with the confusing name of X meaning 10 for the devices 10th anniversary) and the 8th Star Wars installment with an equally confusing name, “The Last Jedi”. The hype during the year was palpable and media experts estimate Apple and Disney spent a combined $2 Billion (yes with a B) to convince us we would love both products. They were wrong. I have an iPhone 6Plus that I purchased at the Apple store in San Francisco in 2014. It’s an amazing device but I resisted the temptation to upgrade to the 6S, 7 and 7S because the improvements were so incremental there was no need to. Same with 8, although wireless charging and a faster processor were tempting. What this did, of course, was make me even more excited to purchase the next generation iPhone, the “X” (10 or Ten but never “x”). In a similar way, “The Force Awakens”, released in 2015, left me wanting to know what happens next. I was so excited when the iPhone arrived at my door Dec 5th that I actually did a little dance when I opened the box. Similarly, I eagerly watched every trailer for the new Star Wars film and engaged in numerous fan conversations about who Rey’s parents were, what is Snoke’s background and will Finn be ok when he wakes up. It could not get any better than this, I thought. I was wrong. Both the X and The Last Jedi are masterpieces in their own rights: both beautiful to look at and packed with amazing, breathtaking technology. But now after I have had time to reflect on both, they both feel somewhat empty and unfulfilling. In both cases I am left with the feeling that this is the end of the revolution (or rebellion) as it were. Using your face to unlock your device definitely seems like a Jedi Mind Trick where you can will your phone to unlock, but after using it for a number of weeks, it worked only about half the time. The actual phone calling ability of the X produced terrible quality phone calls, similar to the pathetically unfunny phone call Poe had with General Hux at the beginning of the movie. While Apple can probably fix this problem in future updates, that sad Family Guy style Star Wars joke will live on forever (like Jar Jar Binks, unless there is a fan version that cuts out the dumb bits). Apples Animoji feature on the X allowing you to turn your face into an animated emoji is fun the first time you see it, like the cute little Porg that befriends Chewy, although in both cases you hope to never see them again. I had high hopes for more battery life with the new phone, but alas, it ran of gas quickly like Vice Admiral Holdo’s cruiser did (before it took one last light-speed blast into the Dreadnaught – what?). Gadget Guy Rob Whent’s high hopes for Solo-esque hero Poe Dameron were dashed in The Last Jedi. In The Force Awakens, I had high hopes for Poe Dameron. He had the Solo Swagger with a bit of Landau Calrissian thrown in for good measure. 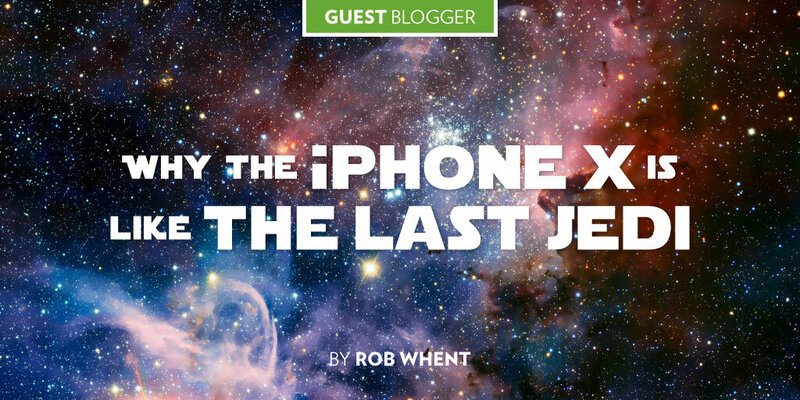 In The Last Jedi he is reduced to a whiny and annoying plot element, like the much maligned and ever present “notch” at the top of the iPhone X. You try hard not to let it bother you, but it does. Big time. Episode VIII was the most expensive Start Wars movie to date, and Apple copied this by making the X the most expensive iPhone ever – and this is its biggest downfall. The 256G version of the iPhone is a staggering $1,730 CDN with tax and the must have Apple Care insurance policy (the entire phone is GLASS!) is an additional $281CDN bringing this phone to just over $2,000! For a phone! Well in the end, I sent the iPhone X back to Apple for a full refund and restored my last backup to my iPhone 6 Plus only to find out that Apple is deliberately slowing its older phones down so they don’t work as well as the new models. Disney may be doing this too – by killing off all the Star Wars characters we love and care about, Disney is slowing down older audiences from wanting to go see Star Wars IX in 2019. Rob Whent is an Industrial Technology Advisor with the National Research Council of Canada’s Industrial Research Assistance Program, helping accelerate the growth of small and medium-sized enterprises by providing them with a comprehensive suite of innovation services and support. He can be reached by emailing him at rob.whent@nrc-cnrc.gc.ca Any views or opinions expressed are that of the author and do not represent those of NRC. Check out Rob “Gadget Guy” Whent’s other guest blog posts: Wearables 2.0, My Internet of Things, Anyone Hungry for a Raspberry Pi?